Throughout the SomaYoga 500 hour teacher training, learning how the mind and body function as one has inspired this curiosity in me to understand on a deeper level. The mind is a fascinating part of life. It creates our reality, stores our memories, houses our intuition and the higher self, and takes in the outside senses. It is complicated and messy, yet organized and necessary. There are four main functions of the mind for mindfulness. There is manas, chitta, ahamkara (ego), and buddhi. Manas is the importer of data, and senses. It observes smell, taste, sight, touch, and sound. The manas begins to notice our likes and dislikes. Chitta is the storehouse of our impressions and memories. 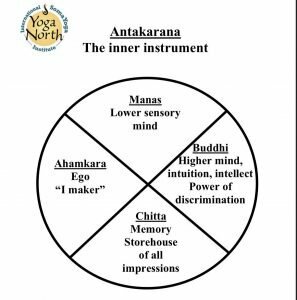 When our mind uses manas, importing different senses, the chitta is what determines our experience. The chitta can have a negative, positive, or neutral charge based on the senses and past memories. An example of manas and chitta that comes to mind is yoga class. Whenever I see a yoga mat or studio, I feel the grounding from the Earth, I smell the aromas in the air, I hear the calming music. This is all part of manas in my mind. As I begin to process this, I realize this is a positive charge for me. It brings back positive memories. I go back in time to some of my first yoga classes, or times of practicing yoga with friends and the positive emotions I’ve had practicing yoga. I want to practice yoga anytime I pass by a studio or see a yoga mat. This is how manas and chitta interact in my mind. Ahamkara (ego) is a strong component of the mind. What takes over more in life than the ego? The ego has this need and hunger to make decisions and to be in power. It is self-focused, and is fueled by our beliefs we created. This is the reality that we created to be true. This becomes who we think we are, creating a sense of self. There is a purpose to the ego, to keep us safe. The more I become aware of how ego is controlling my reality, the more I fight with it. I become resistant. I try to push it down, to hide it. And, the more I fight it, the harder it fights back. An elegant dance is needed to care and tend to the ego, but also to be mindful of not letting my ego control everything. This is where buddhi comes into play, with mindfulness. Buddhi is the inner wisdom, the intuition, the larger self. Buddhi can be seen as a guide for making decisions about life. It judges, discriminates, and is a witness. Buddhi allows one to focus on the larger self. My ego tells me I am a yoga instructor. I have created this belief that this is who I am. I center my life around creating, teaching, and expressing yoga. It provides me a sense of self, a sense of security. I believe this is who I am, a yoga instructor. Without this belief about myself, I would be lost in who I thought I was. But, I am more than a yoga instructor. I can see myself as more than this; I am a human being full of so many qualities, beliefs, passions, desires, and wisdom. Because of buddhi I see my larger self, a deeper wisdom, and intuition. I know I have a greater purpose to my life. Buddhi has allowed me to become a yoga instructor, as a made the decision in my life to help me along the greater path. With practice I start to become more aware of how my mind functions. As I learn more about mindfulness, being aware of my thoughts and being nonjudgmental of those thoughts, the easier buddhi appears. As I stated before, an elegant dance is needed between the functions of the mind. They all play a vital role in our existence, but being aware of our mind and how it functions can lead us to a greater freedom.